In the late 1700s members of the Bearns family lived in the adjoining parishes of Woodland and Torbryan. William Bearns and Susanna Holditch were married at Woodland on December 23rd, 1794. He was of the parish whilst she was a sojourner - both signed the register. At some stage the couple came to Ashburton: they initially had two children, William and Susanna (mentioned in their sister Elizabeth's will) and these were probably William Barnes baptised in Ashburton on June 30th 1796, and Susanna Barnes, daughter of William and Susanna, who was baptised on November 8th, 1797. An 1814 lease between Walter Palk and others and Henry Collings of Ashburton concerns premises at Balland Park - timber rights, mines and quarries were reserved. A William Bearns was in occupation. The Palk family have other links with the Bearns family - see the sections below on the Bearns of Torbryan - but these Palks may not be connected with each other. *It seems likely that Susanna was the daughter of Samuel and Joan Holditch, baptised in Buckfastleigh in October 1766 - a Samuel Holditch was a witness at her wedding to William. In this case she was nearer 50 than 40 years old. In March of the same year Mr Bearne had lately been the tenant of Reeve's Meadow and George's Meadow, 'with an excellent linhay and barn', together with Balland Park. Of the remaining three children only Elizabeth stayed in Ashburton. George Holditch married a Mary Ann Bryant in London in 1831, and was buried in St Luke, Chelsea, Middlesex, ten years later. Harriet's whereabouts are difficult to determine, but by 1879 she was named in her sister Elizabeth's will as Harriet Parsons. Her child William Bearns Parsons is named in William Bearns' Snr's will of 1843. The tithe map of Ashburton in 1840 shows William Bearnes as having a house and orchard in East St - approximately two doors down from the Red Lion Inn. He also owns fields at Goose Pool and Leny Hill. In the 1841 census, William Bearns, of independent means, is living in East Street. He is approximately 70 years old; 30 year old Elizabeth Bearns is also in the same house. He was buried, aged 72, in 1843, and in his will he asked for his body to be 'frugally interred'. He appointed his son Thomas and his daughter Elizabeth as executor and executrix. Elizabeth Holditch Bearns married Samuel Hannaford in 1845, in the Newton Abbot registration district. A settlement made at the time (referred to in her will) has Thomas Bearns of Dartington, yeoman, as one of the parties, together with Thomas Bearns the younger, also a yeoman of Dartington. A third party is John Shapter, a grocer and draper of Buckfastleigh. Censuses suggest a link between these Dartington Bearns and Torbryan - eg in 1851 sixty year old Thomas Bearns, a farmer of 230 acres and living at Dartington, says he was born in Torbryan. When a Thomas Bearns from a previous generation married in Torbryan in 1790, his wife was Elizabeth Palk and one of the witnesses was Wm Palke. Meanwhile in Ashburton the 1851 census shows Elizabeth Hannaford (Head of house) living in East Street - probably the same house that her father occupied. She is a landed proprietor - her husband Samuel is not with her on census night. In 1861 Samuel and Elizabeth appear to still be living in the same house. Between the Red Lion Inn and the property they are occupying, several people are living in Hannaford's Court - possibly owned by Samuel and his wife and named after them? The 1873 Return of Owners of Land shows Samuel Hannaford of Ashburton owning over 65 acres of land, bringing in a rental of £120 12s. This might have included Meade, which, according to Stephen Woods, Samuel inherited from his father John in 1833. Samuel's brother Roger was occupying it (or at least the portion called Higher Mead) in the 1840s. Elizabeth Holditch Hannaford died in 1879, and was buried at Ashburton. In her will she left bequests to her brother Thomas and to her sister Harriet Parsons, and to children of her deceased brothers and sister William Bearns, George Bearns and Susanna Ellidge. The house, garden and orchard in East Street she left to her husband Samuel, 'with the tenements thereto belonging'. 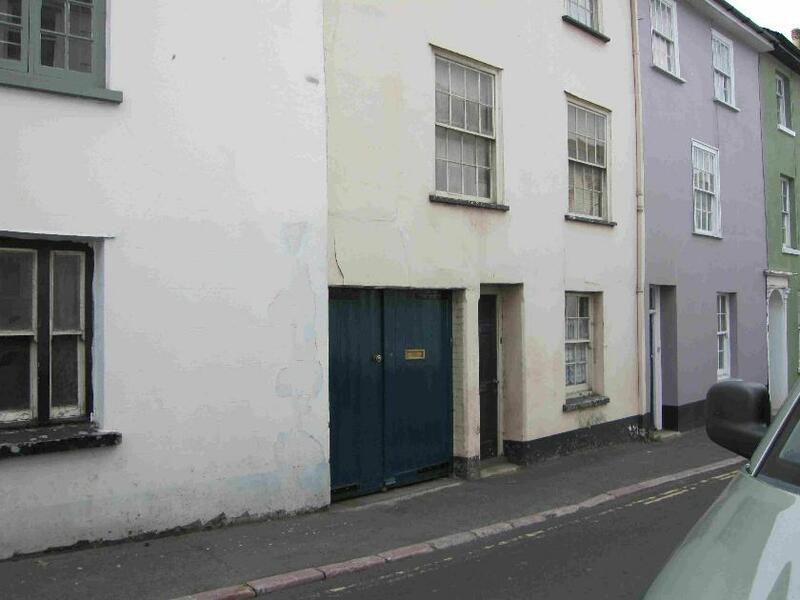 There was an auction at Totnes in 1870 of various land and property. Lot 2 was a field in Ashburton, adjoining the turnpike road to Exeter, called 'Late Goulds' on the parish map. Samuel Hannaford was currently renting it. In September 1887 Sawdye and Son held an auction at the Golden Lion for properties in East Street, for the representatives of the late Mrs Samuel Hannaford. The properties were freehold, and occupied at the time by S Hannaford, M Nix, W Willis and others. The sale consisted of two dwelling houses and several tenements, with a 'capital orchard and garden', the plot being 2 roods and 16 perches, and bringing in a rental of £37 per year. The auctioneers couldn't achieve the reserve of £500 - £350 was the highest bid - so Mr Herbert Hannaford, of Widecombe, added £5 to the reserve and bought the properties for £505. Samuel Hannaford, described by the Western Times as one of the most respected townsmen of Ashburton, died in August 1894, aged 87. He was an 'influential member' of the Methodists. In his will he had appointed his nephew Henry Herbert Hannaford as his executor. One of his duties was to invest the rents from the 'field or close of land called Banks Brim otherwise Carrion Pit Lane field' in a good security, to be released to John Berry Honywill (the son of his late nephew John Hannaford Honywill) when he reached the age of 21. In the 1901 census John B Honywill is living in East Street, probably in the house that Elizabeth had owned. Wills of Elizabeth Holditch Hannaford and Samuel Hannaford - many thanks to Karen Bearns for this.